« Older: 3rd Annual Wahoo challenge today! 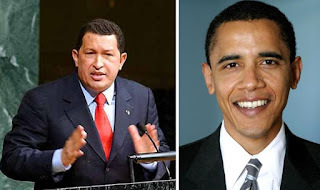 The Venezuelan President, Hugo Chavez, has welcomed suggestions that the new US administration now headed by President Barrack Obama might be ready for better relations. But President Chavez stated Washington must make the first move. In a newspaper article, President Chavez stated that the US would be greeted with open arms if it was the first to unclench its fist. In his inaugural address, President Obama said his administration would be prepared to extend a hand to America's antagonists around the world if they were prepared to open their fists.